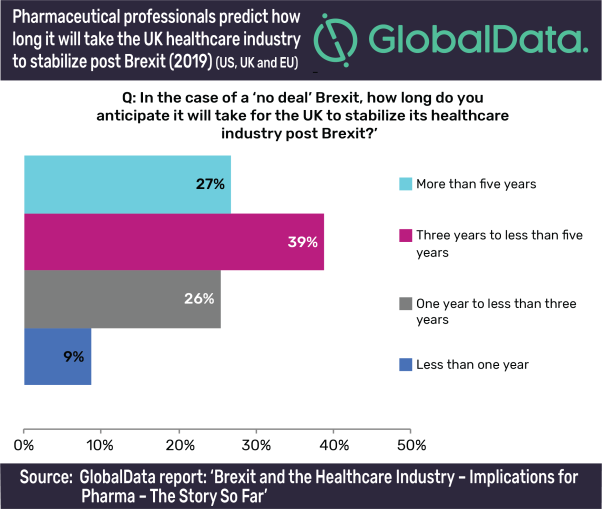 GlobalData’s latest report, ‘Brexit and the Healthcare Industry – Implications for Pharma – The Story So Far’, revealed that 66% of participants across the US, UK, and EU suggested that it would take more than three years for the UK to stabilize its healthcare industry, compared to only 9% of respondents who indicated that stabilization would occur in less than 12 months. Gavin Davidson, MSc, Pharma Analyst at GlobalData, commented: “In the event of a ‘no deal’ Brexit, it is not surprising that two thirds of respondents were in consensus regarding how long it will take the UK to stabilize. Approximately 44% of the UK’s exports are traded to EU countries, with a considerable proportion representing healthcare-associated industries. Without a free trade deal being agreed upon prior to departure, the UK would no longer have access to the EU single market. Participants indicated that ‘three years to less than five years’ would be the most likely timeframe as 39% of the 149 surveyed conveyed this opinion after the events in January 2019, which included the rejection of Theresa May’s Brexit deal during the meaningful vote. Amongst these participants, 64% were vice/senior/executive level presidents, and 57% were associate level employees, indicating some agreement amongst the varied tiers within the pharmaceutical sector. Gavin adds: “It’s exceptionally difficult to forecast just how long it will take for stabilization of the healthcare industry to occur post-Brexit, due to the multiple potential outcomes. After the monumental rejection of Theresa May’s revised Brexit deal on Monday 12th March 2019, members of Parliament will be given the opportunity to decline the notion of a ‘no deal’ Brexit, as well as to vote on the extension of Article 50 of the Lisbon Treaty. “If this were to occur, the UK would be on track for remaining in the EU during the EU elections, further extending and complicating the detrimental effects towards the healthcare sector, and the economy as a whole. However, May’s response to the voting results indicated different avenues that could be explored if article 50 were extended, including the possibility of a second referendum. Prior to the second ‘meaningful vote’, May’s stance was completely against this notion, emphasising a deal or ‘no deal’ exit out of the EU. Most participants surveyed by GlobalData believed that the most auspicious outcome of Brexit would be to have no Brexit at all.